روحانی, مهدی, کرد, بهزاد. (1395). خواص مکانیکی دینامیکی و گرمایی کامپوزیت های هیبریدی باگاس/الیاف شیشه/پلی پروپیلن. مجله صنایع چوب و کاغذ ایران, 7(1), 103-114. مهدی روحانی; بهزاد کرد. "خواص مکانیکی دینامیکی و گرمایی کامپوزیت های هیبریدی باگاس/الیاف شیشه/پلی پروپیلن". مجله صنایع چوب و کاغذ ایران, 7, 1, 1395, 103-114. روحانی, مهدی, کرد, بهزاد. (1395). 'خواص مکانیکی دینامیکی و گرمایی کامپوزیت های هیبریدی باگاس/الیاف شیشه/پلی پروپیلن', مجله صنایع چوب و کاغذ ایران, 7(1), pp. 103-114. روحانی, مهدی, کرد, بهزاد. خواص مکانیکی دینامیکی و گرمایی کامپوزیت های هیبریدی باگاس/الیاف شیشه/پلی پروپیلن. 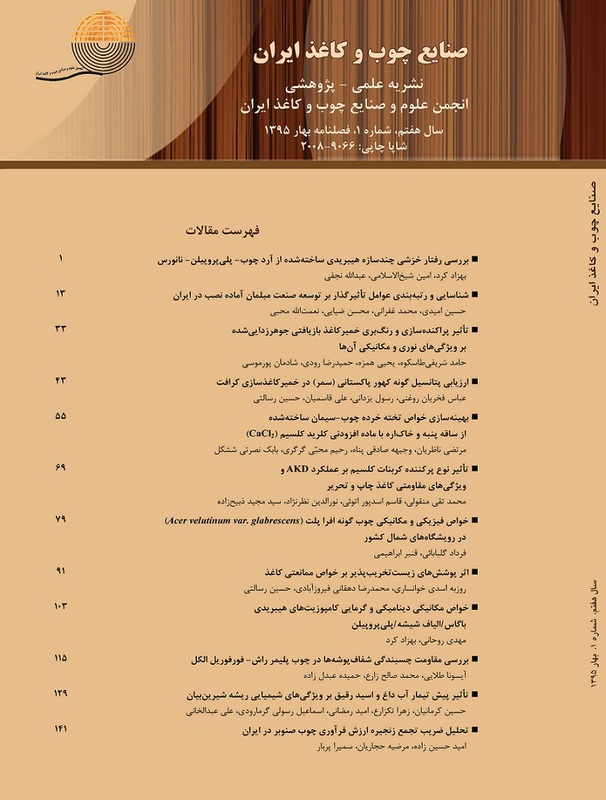 مجله صنایع چوب و کاغذ ایران, 1395; 7(1): 103-114. این پژوهش به منظور ارزیابی خواص گرمایی و مکانیکی دینامیکی کامپوزیت های هیبریدی باگاس/الیاف شیشه/پلی پروپیلن انجام شد. کامپوزیت های هیبریدی با روش اختلاط مذاب ساخته شدند و خواص آنها با آزمون گرماسنجی روبشی تفاضلی(DSC) و آزمون مکانیکی دینامیکی(DMA) مورد بررسی فرار گرفت. نتایج حاصل از آزمون گرماسنجی روبشی تفاضلی مشخص کرد که با افزودن باگاس و الیاف شیشه، دمای ذوب و دمای بلورینگی به دماهای بالاتر انتقال یافت و درجه بلورینگی افزایش پیدا کرد. این یافته ها آشکار ساخت که باگاس و الیاف شیشه نقش عامل هسته زا را در کامپوزیت ایفا می کنند. آزمون مکانیکی دینامیکی نشان داد که با وارد کردن باگاس و الیاف شیشه به ماتریس پلی پروپیلنی، مدول ذخیره ( ) و مدول اتلاف ( ) افزایش یافته، درحالی که از فاکتور اتلاف (tanδ) کاسته شد. به منظور ارزیابی اثر تقویت کنندگی با افزایش دما، ضریب اثربخشی (C) در دامنه های دمایی مختلف محاسبه و مشخص شد که در دماهای بالا بهبود خواص مکانیکی در اثر حضور الیاف، ملموس تر است. کیفیت چسبندگی الیاف- ماتریس با محاسبه فاکتور چسبندگی (A) بر حسب فاکتور اتلاف کامپوزیت (tan δc)، فاکتور اتلاف پلیمر (tan δp) و جزء حجمی الیاف (fФ) تعیین شد. مقادیر محاسبه شده فاکتور چسبندگی (A) نشان داد که با افزودن الیاف شیشه به سیستم باگاس/پلی روپیلن، چسبندگی الیاف- ماتریس بهبود می یابد. کامپوزیت هیبریدی متشکل از 25 درصد باگاس و 15 درصد الیاف شیشه، چسبندگی الیاف- ماتریس بهتری را بروز داد. Amash, A. and Zugenmaier, P., 2000. Morphology and properties of isotropic and oriented samples of cellulose fibre–polypropylene composites. Polymer, 41 (4):1589-1596. Joseph, P. V., Mathew, G., Joseph, K., Groeninckx, G. and Thomas, S., 2003. Dynamic mechanical properties of short sisal fibre reinforced polypropylene composites. Composites Part A: Applied Science and Manufacturing, 34(3):275-290. Ornaghi, H. L., Bolner, A. S., Fiorio, R., Zattera, A. j. and Amico S. C., 2010. Mechanical and dynamic mechanical analysis of hybrid composites molded by resin transfer molding. Journal of Applied Polymer Science, 118 (2):887-896. Oksman, K.and Sain, M., 2008. Wood-Polymer Composites, Woodhead Publishing Ltd, Great Abington, Cambridge, UK, 366p. Rowell, R.M., 2005. Hanbook of Wood Chemistry and Wood Composite. CRC Press; 2nd edition, 703p. Fu, S. Y., Xu, G. and Mai, Y. W., 2002. On the elastic modulus of hybrid particle/shortfiber/polymer composites. Composites Part B: Engineering, 33(4): 291–299. Karger-Kocsis, J., 2000. Reinforced polymer blends. In D. R. Paul, & C. B. Bucknall (Eds. ), Polymer blends (p. 395). New York: John Wiley & Sons. Thwe, M. M. and Liao, K., 2003. Environmental effects on bamboo–glass/polypropylene hybrid composites. Journal of Materials Science, 38(2): 363–376. Thwe, M. M. and Liao, K., 2003. Durability of bamboo–glass fiber reinforced polymer matrix hybrid composites. Composites Science and Technology, 63(3–4): 375–387. Jawaid, M. and Abdul Khalil, H.P.S., 2011. Cellulosic/synthetic fibre reinforced polymer hybrid composites: a review. Carbohyd Polym, 86(1): 1–18. Panthapulakkal, S. and Sain, M., 2007. Studies on the water absorption properties of short hemp-glass fiber hybrid polypropylene composites. J. Comp. Mater, 41(15):1871-1883. John, K. and Naidu, S. V., 2007. Chemical Resistance of Sisal/Glass Reinforced Unsaturated Polyester Hybrid Composites. Journal of Reinforced Plastics and Composites, 26(4): 373-376. Aquino, E. M. F., Sarmento, L. P. S., Oliveira, W. and Silva, R.V., 2007. Dynamic mechanical analysis of pineapple leaf/glass hybrid fiber reinforced polyester composites. Polymer Composites,31(6):956-965. Ahmed, K. S. and Vijayarangan, S., 2006. Elastic property evaluation of jute-glass fibre hybrid composite using experimental and CLT approach. Indian Journal of Engineering and Materials Sciences, 13(5): 435-442. Schledjewski, R. and Karger-Kocsis, J., 1994. Dynamic mechanical analysis of glass mat-reinforced polypropylene (gmt-pp). Journal of Thermoplastic Composite Materials, 7:270-277. Idicula, M., Malhotra, S. K., Joseph, K. and Thomas, S., 2005. Dynamic mechanical analysis of randomly oriented intimately mixed short banana/sisal hybrid fibre reinforced polyester composites. Composites Science and Technology, 65(7–8):1077–1087. Correa, C. A., Razzino, C. A. and Hage, Jr., 2007. Role of Maleated Coupling Agents on the Interface Adhesion of Polypropylene–Wood Composites. Journal of Thermoplastic Composite Materials, 20:323-329. Swaminathan, G. and Shivakumar, K., 2009. A re-examination of DMA testing of polymer matrix composites. Journal of Reinforced Plastics and Composites, 28(8): 979–994. Pothan, L. A., George, C. N., John, M. J.and Thomas, S., 2010. Dynamic mechanical and dielectric behavior of banana–glass hybrid fiber reinforced polyester composites. Journal of Reinforced Plastics and Composites, 29(8):1131–1145. Devi, L. U., Bhagawan, S. S. and Thomas, S., 2010. Dynamic mechanical analysis of pineapple leaf/glass hybrid fiber reinforced polyester composites. Polymer Composite, 31: 956–965. Ornaghi, HL., da Silva H. S. P. and Zattera, A. J., 2011. Hybridization effect on the mechanical and dynamic mechanical properties of curaua composites. Material Science Engineering, 528: 7285–7289. ASTM D E1640., 2013. Standard test method for assignment of the glass transition temperature by dynamic mechanical analysis, American Society of Testing and Materials. Kubat, J., Rigdhal, M. and Welander, M., 1990. Characterization of interfacial interaction in high density polyethylene filled with glass spheres using dynamic mechanical analysis. Journal of Applied Polymer Science, 39: 1527–1539. Matuana, L. M. and Kim, J. W., 2007. Fusion characteristics of rigid PVC/wood-flour composites by torque rheometry. Journal of Vinyl and Additive Technology, 13(1): 7–13. Ndiaye, D., Matuana, L. M., Morlat-Therias, S., Vidal, L., Tidjani, A. and Gardette, J. L., 2010. Thermal and Mechanical Properties of Polypropylene/ Wood-Flour Composites. Journal of Applied Polymer Science, 119: 3321–3328. Nayak, S. K., Mohanty, S. and Samal, S. K., 2009. Influence of short bamboo/glass fiber on the thermal, dynamic mechanical and rheological properties of polypropylene hybrid composites. Materials Science & Engineering A, 523(1-2): 32-38.